The Peace Region Forage Seed Association was formed in 1995. The association brought together the longer histories of several associations in the Peace River region of both Alberta and British Columbia. The Fine Seed Committee of the BC Grain Producers Association and the Alberta Alfalfa Seed Producers Association - Peace Branch and local members of the Canadian Seed Trade Association added their years of experience and expertise working for the industry, to the association. PRFSA celebrated its 10th anniversary in 2005 and its 15th anniversary as an association in 2010. From a handful of committed people in 1995, the membership in the Peace Region Forage Seed Association grew to 215 members in 2002. In 2005, the levy paid by forage seed growers constitutes membership in PRFSA. Currently there are 1160 grower members and over 50 corporate and associate members. A seven member Board of Directors drawn from the PRFSA membership governs all activities of the Peace Region Forage Seed Association. The board consists of three Alberta producers, three BC producers and one seed trade member. The association also has three provincial government advisors and one research advisor. The directors contribute their time and expertise. They are reimbursed for direct expenses, their travel and a per diem for their contributions. They currently have several contractors hired who each work part time for this association including a coordinator, a bookkeeper, and a central levy administrator. Information is shared with members in several ways. PRFSA collaborates with authors across Canada to produce and distribute the “Forage Seed News” a high quality magazine compiled three times a year. 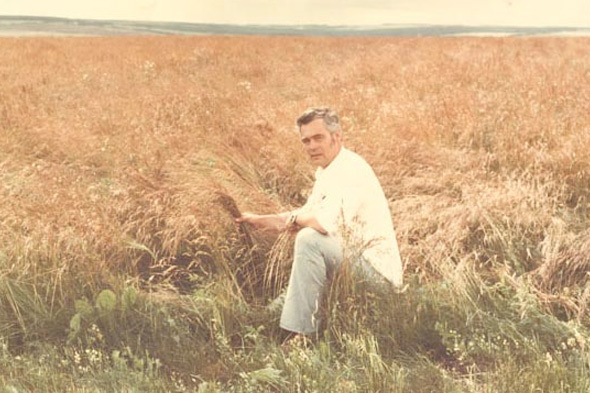 They also partnered with Alberta Agriculture to produce publications such as the "Tall Fescue Seed Production" Agr-Facts sheet in 2005. They organize annual marketing and production seminars along with their AGMs in Fort St. John and Fairview that have attracted anywhere from 65 to 180 people. As well, they organize tours and field days over the summer. Once every 6 years the association hosts the Canadian Forage Seed Conference. The PRFSA directors respond to the concerns of growers and the industry as they arise. Endophyte surveys and an information blitz were initiated in response to reported endophyte concerns in forage seed aftermath bales (1998). They responded to the glassy cutworm outbreak with timely research and information fact sheets (2000). They also launched an initiative to keep leaf cutter bees disease free in the Peace Region (2001). PRFSA responded to the red clover case bearer problem with collaborative research (2007). They also initiated a wildlife damage study on fescue in response to growers’ requests (2009). • Establishment Systems for Seed Production of Creeping Red Fescue. • Wild Oat Control in Established Seed Crops of Tall Fescue. • Control of Cutworms in Grass Seed Fields Project. PRFSA has partnered with several funding agencies in the past on many successful projects. Funding partners over the years have included: Western Canadian Grass Seed Testing Program, Agriculture &Agri-Food Canada, Alberta Agriculture, BC Ministry of Agriculture, Peace River Agriculture Development Fund, BC Investment Agriculture Foundation, Smoky Applied Research and Demonstration Association, Peace River Forage Association of BC, BC Grain Producers Association, Farming for the Future, (AAFRD), Lamorna Enterprises Ltd., University of Alberta (Biology Department), Agriculture Environment & Wildlife Fund (IAF/ ARDCORP) and Developing Innovative Agri-Products Initiative (DIAP/ AAFC). The Peace Region Forage Seed Association has earned the trust and respect throughout the forage, turf and native seed industry and is recognized as the ideal vehicle to represent this region's industry and spearhead initiatives on its behalf. Download the membership form below. You can become a regular member of the PRFSA or a Corporate member as a company. Want to be more involved in how your levy dollars are managed? Have you ever considered letting your name stand in elections to become a director of PRFSA? Download the pamphlet below to see what is involved. 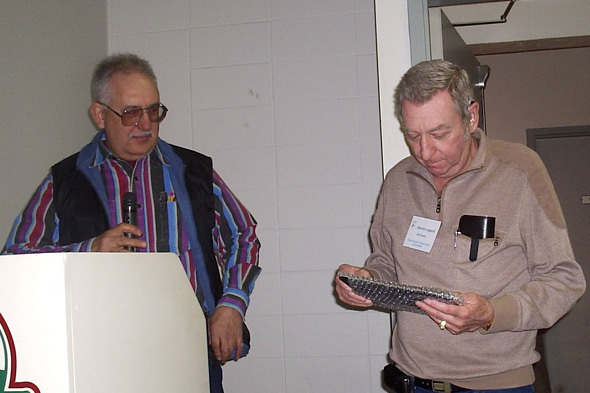 Ken receives Recognition Award from Dave Forgie at Canadian Forage Seed Conference in March, 2006 (photo above). Jack was recognized for his work on creeping red fescue and his contributions to the forage seed industry. Link: Tribute to Jack Dobb compiled by Dave Wong in August, 2011. Newspaper article about Jack's career on his retirement in June 1997. 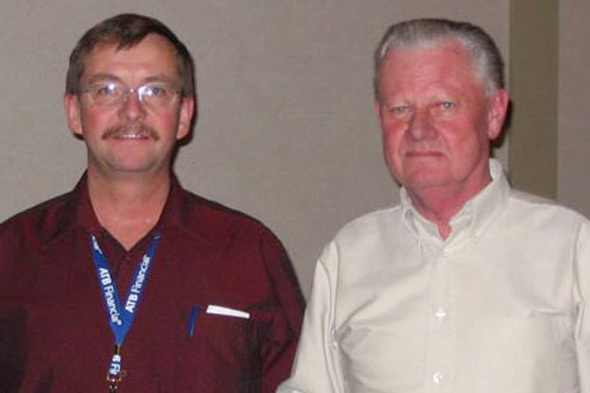 Dave Forgie (President PRFSA) presented Don Pedersen with a recognition award at the 2006 Canadian Forage Seed Conference. For more details click on this link: Don Pedersen Recognized compiled by Dave Wong in August, 2013. Bernie Legault was honoured for his contributions to the alfalfa seed and leafcutter bee industries and for all his contributions to the Peace Region Forage Seed Association over the years. 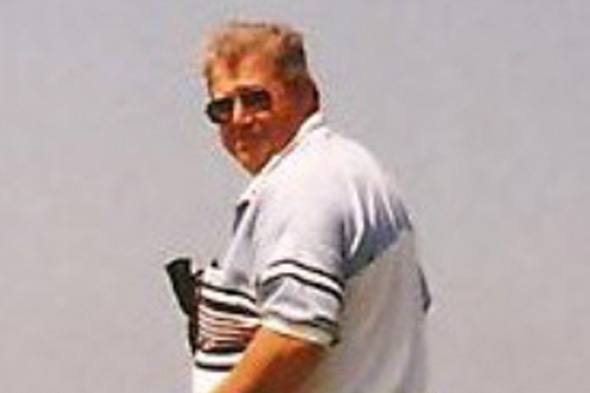 Weldon Hobbs outlined Bernie's eventful career with the industry. One triumph for Bernie was his spearheading efforts to keep the Peace Region chalkbrood free. This is a great achievement as the Peace Region is one of the few areas left in the world free from this disease.